The CFA intern Saskia England IMd me excitedly earlier with this picture and the message: "Dad's female has successfully dropped her barb!" As I know that Sas's father keeps freshwater stingrays, I was not as perturbed by this message as I otherwise might have been, so I asked for further details. She wrote back with the following picture, and this message: "The larger one is the female's (which she shed today) and the smaller one beside is the male's from a month ago". "They shed in order to grow new ones.. Just like sharks with their teeth"
Unlike a wasp stinger, a stingray stinger is not hollow and does not inject anything. It is simply a physical weapon, like a dagger, not a chemical one. Stingrays have a set of barbs each one smaller than the next. As one is used the next one in line grows to replace it. Very similar to the way sharks replace lost teeth. Stingray skin is covered partially in dermal denticles (literally ‘skin teeth’) that contain dentine just like normal teeth. They look like short pointed spikes when viewed under a microscope. The ray’s tail spines are modified dermal denticles that have become elongated so that the can be used as defensive weapons. And she signed off with a picture of her Dad's rays. What a nice way to brighten up the last evening of my 54th year! KARL SHUKER: The Das-Adder - A Hyrax-Headed Hypnotist? What has the head of a hyrax and the body of a viper? Why, the das-adder, of course! 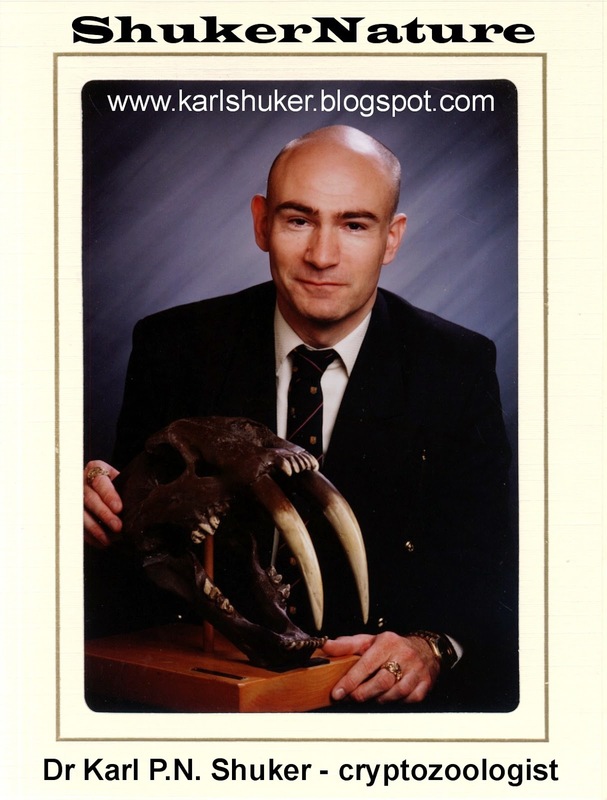 Karl Shuker explains. I cannot believe that it has been a whole week since the Weird Weekend kicked off. And what a peculiar week it has been. On the late morning of Saturday 16th August my friend and colleague Lars Thomas, together with his son, was walking around the village of Hartland when they saw a large tortoiseshell (Nymphalis polychloros) basking in the sun on the perimeter wall of one of the gardens. He watched it for three or four minutes before it flew away. Lars is a professional Naturalist, and someone whom I trust implicitly. I am aware that Hartland could be seen as being a little far north for vagrant insects to have crossed the channel but, it is only sixty odd miles from Dartington Hall in Southern Devon where they have been reported in recent years. I am making no claims as to the provenance of this insect, and extrapolating nothing from its sighting apart from the fact that it was seen by an impeccable witness. I am also very happy to say that The Small School made a substantial profit on the Weird Weekend having banked over twelve hundred quid. That is very gratifying, and I hope that we can improve on this tally next year. Forget Bigfoot Sighting Databases, Now There's a Bigfoot Face Database!